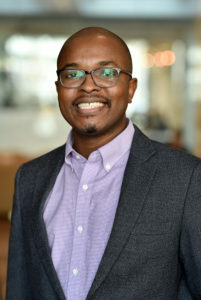 Cedric Asiavugwa died on the morning of Sunday, March 10, as he was traveling home to Kenya during Georgetown Law’s spring break. He was one of 157 passengers on Ethiopian Airlines Flight ET302 that crashed near Addis Ababa. Staff, students and professors all said that there was no corner of Georgetown Law that was not made better by this one remarkable international student. This is also true of Georgetown University, where Cedric lived as a Resident Minister on the second floor of the New South dorm. He will also be missed at St. Aloysius Gonzaga High School in Nairobi, where he served as director of Development before law school. He continued to work as much as 20 hours a week for the school as a law student, raising funds and traveling within the United States. In the Office of Campus Ministry, a sympathy card now rests on the same table where Cedric worked during his 2L and 3L years, as much as 20 hours a week. He was in the office every day, said Mary Novak, associate director for Ignatian Formation at Georgetown Law. For a law student worker, Cedric had a unique set of credentials. 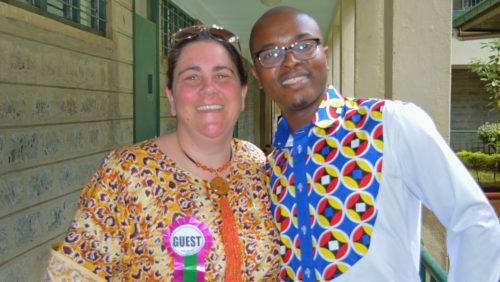 Born in Mombasa, Kenya, on July 24, 1986 — a member of the Luhya tribe — he joined the Jesuits in 2007 and spent the next eight years discerning a vocation. Although he would ultimately turn to the law, he spent two years in the Jesuit novitiate in Arusha, Tanzania, before studying philosophy at the University of Zimbabwe, graduating with highest honors, in 2013. He next went to Nairobi, to work at the Jesuit Hakimani Center on Social Concern — developing a passion for refugee law. 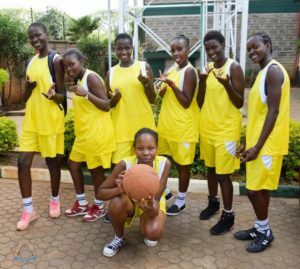 He then joined the staff at St. Aloysius Gonzaga High School in Nairobi during 2015-16. It is a school for students affected by HIV/AIDS, having lost one or both parents. Father Terry Charlton, S.J., the cofounder of St. Aloysius (and Cedric’s Jesuit vocation director in Kenya), suggested that Cedric apply for the job after he discerned that the priesthood was not for him. Another mentor in the Jesuit community had already suggested that he apply to Georgetown Law, and he needed a year as a bridge. Cedric served on the board of directors of St. Aloysius, and until three days before his death, was planning to spend spring break in Chicago at a board meeting, said Novak. The school, she said, was in the middle of the largest slum in Nairobi. Jewish Chaplain Michael Goldman (L’69) related how Cedric, as part of his office duties, would obtain food for Torah study on Fridays — and ended up being part of the group. During the week, he said, students would often come in to the office to talk to a chaplain, but leave after talking to Cedric at the table, because he made them feel better. Before he even arrived on Georgetown Law’s campus in the fall of 2016, Cedric was selected to be a Blume Public Interest Scholar and a Global Law Scholar. Students at St. Aloysius in Nairobi read letters and cards from Georgetown students. Barbara Moulton, director of Georgetown Law’s Office of Public Interest and Community Service, was impressed by this soft-spoken and compassionate law student at a dinner for the Public Interest Law Scholars Program — now called the Blume Public Interest Scholars Program. Blume Scholars are selected for extensive public service experience and a demonstrated commitment to pursuing a public interest legal career. Cedric also worked for OPICS as a student worker during his 1L year. “It was quite a cultural change for him, and that may have been the religious/spiritual part, but I think this was the first time he lived in the United States,” said Moulton. As a Global Law Scholar, Cedric diligently completed a group project on election interference in international law, said his fellow GLS classmate Junsuk Lee (L’19). As a 2L, Cedric participated in the International Women’s Human Rights Clinic and took Adjunct Professor Melissa Reinberg’s Negotiation and Mediation Seminar. When the seminar was over, he co-taught two eight-week negotiations classes with Reinberg at a D.C.-area women’s homeless shelter, Calvary Women’s Services. “His commitment to social justice for all and for the people of Kenya in particular was deep and genuine,” Reinberg said, noting that he wrote a sophisticated, insightful paper about how court-mandated mediation could be improved for rural Maragoli women. Cedric earned the highest grade in the course. He returned to Kenya for both his one 1L and 2L summers, working for a Nairobi law firm. But Cedric’s particular passion was refugee work, which he was beginning to develop through the lens of environmental justice. Last fall, he participated in the Center for Applied Legal Studies clinic, which represents refugees seeking asylum in the United States. In the meantime, he was content with his life at the Law Center, and also on Main Campus. Cedric was a Pedro Arrupe Scholar — awarded to students at Georgetown University to enable international students with financial need, from a country with social conflict, to attend, said Fr. Gregory Schenden, S.J. Cedric reached out to the Jesuit community when he arrived at Georgetown and soon became a Resident Minister, living on the second floor of the New South Residence Hall. The position is reserved for those with divinity training, and Cedric took care of undergraduates when he left the Law Center each night. They never had the visit. On the Thursday before spring break, an uncharacteristically upset Cedric told Novak that he needed to change his travel plans from Chicago to Kenya. He needed to travel home to be with his fiancée, who had just lost her mother. In the meantime, he needed to talk. He loved his fiancée, he loved her mother. He told Novak: “I just have to go. I just have to go.” The soonest he could fly out was Saturday. On Sunday morning, Father McCann woke and saw news of the tragedy. Hoping against hope that Cedric had taken another flight, he called Charleton, who was waiting for Cedric in Nairobi. McCann asked if Cedric was safe; Charleton said no. In Kenya on Friday morning, March 15, Charleton had mass with the senior St. Aloysius students in Nairobi, who knew and remembered Cedric as a staff member. Charleton urged them to follow his example — day by day, becoming all that you can become. Already, Cedric had plans to speak at an environmental justice event in April and to work at a law firm in Cincinnati this summer. You may share your own memories of Cedric by visiting his memorial page. The Offices of CAPS, Campus Ministry and the Office of the Dean of Students will host a second community meeting this coming Monday, March 18 at 4:00 pm. in McDonough 520. This an informal opportunity for students, staff and faculty to remember, listen, share and grieve together. RSVP is not necessary. The Office of Campus Ministry also welcomes visitors throughout the day on Monday who may be seeking solace before the community meeting. Law students have organized a GoFundMe page so that those wishing to assist Cedric’s family may do so. A memorial service is being planned to celebrate Cedric’s life and many contributions to Georgetown and the broader social justice community.